Jenny and Johnny at The Waiting Room, Sept. 11, 2010. I’ve got some interesting good news, but it’ll have to wait until tomorrow’s column. 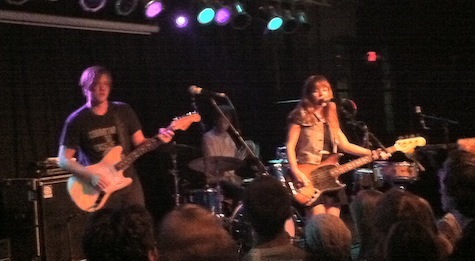 For now, here’s a belated review of last Saturday night’s show at The Waiting Room. Opener, Sub Pop band Love as Laughter, was a trio of Brooklyn guys who spent the first 15 minutes of their set playing the same flat, mid-tempo song over and over (well, at least it sounded like it). But about four songs in, they shifted gears to more conventional indie rock (one song even had an uptempo, boogie vibe). Overall, the songs were consistently too long, but at least it became a little less boring by the end. A couple little girls (little girls made up most of the sold-out audience) even danced a grind to the last couple songs. Now more than 10 years after the first Rilo Kiley EP was released, Jenny Lewis continues to be one of the cutest indie rock performers on stage. She’s got a sweet voice and a killer smile, and that combination can take you far in this business. It’s apparently taken her to the “tour bus” level, or at least I assume that giant bus parked right outside TWR was hers. I thought those monsters were reserved for arena/casino-sized artists, but apparently Warner Bros. has high hopes for this new album. And while the songs on I’m Having Fun Now (the Jenny and Johnny WB debut) are kinda catchy, none of them hold a candle to the songs on either of her first two solo albums. But what do I know about music marketing? So who got the better deal out of this merger? Hands down it was Johnathan Rice, whose singer/songwriter fare I’ve always found to be somewhat droll. With Lewis and this band behind him, he ratchets up the rock to new levels (for him, anyway); while Lewis comes away relatively unscathed, but no better off than where she started. The band’s secret weapons are their lead guitarist (who looked like he was 17 years old), and drummer Jason Boesel, who Lewis fans remember from Rilo Kiley. As a whole, it was worth it so see Lewis in a smaller setting (rather than the Slowdown’s big stage or Scottish Rite). If she ever starts earning that tour bus, you won’t get another chance to see her in such an intimate setting again. Tonight at The Barley St., Kyle Harvey shows off his fine art skills, along with his musical skills. Joining him will be Nicole Le Clerc, Lincoln Dickinson, and Michael Trenhaile. 9 p.m. (no idea on the price). Also tonight at The Sydney, Bear Country plays a show with Sam Martin (Capgun Coup) and Toronto band Wooden Sky. $5, 9 p.m.